New architectural designs by Hoskins Architects for the proposed world-class hotel at Edinburgh’s former Royal High School have been revealed and the operator partner confirmed within a planning application submitted to City of Edinburgh Council today. One of the world’s most respected hotel brands, Rosewood Hotels and Resorts®, has been selected to manage the Calton Hill property. The company currently manages 18 properties in 11 countries including historic hotels such as The Carlyle in New York and Rosewood Castiglion del Bosco in Tuscany as well as contemporary classics such as the award-winning Rosewood London. Rosewood has extensive experience of restoring and transforming historic buildings, many of which are listed or are located inside World Heritage Sites. In Paris, Rosewood is overseeing the complete restoration of Hôtel de Crillon, one of the world’s most iconic hotels. Situated overlooking Place de la Concorde in the centre of Paris, the eighteenth century building is a Parisian landmark which embodies the poise, elegance and spirit of Paris. Rosewood Hotels & Resorts® manages 18 one-of-a-kind luxury properties in 11 countries, with 14 new hotels under development. Each Rosewood hotel embraces the brand’s A Sense of Place® philosophy to reflect the individual location’s history, culture and sensibilities. The Rosewood collection includes some of the world’s most legendary hotels and resorts, including The Carlyle, A Rosewood Hotel in New York, Rosewood Mansion on Turtle Creek in Dallas and Hôtel de Crillon, A Rosewood Hotel in Paris, as well as new classics such as Rosewood Beijing. Rosewood Hotels & Resorts targets 50 hotels in operation by 2020. Award-winning architect Gareth Hoskins OBE heads the project team. He trained at the Glasgow School of Art and at Florence University and set up Hoskins Architects in 1998. Through a series of major competition wins, Gareth has built up one of the foremost design practices in the UK with a reputation for producing creative and innovative buildings and environments. The practice works internationally from studios in Glasgow and Berlin. He was responsible for the redevelopment of the Grade A listed National Museum of Scotland and is currently working on projects for the expansion of the National Gallery of Scotland on The Mound in Edinburgh and the World Museum in the centre of Vienna. The proposal to turn the former Royal High School into a world-class hotel is led by local partners Duddingston House Properties (DHP) and Urbanist Hotels. They lead an institutional group of investors and funding has been in place since early 2014. This is an exemplar restoration project to restore Hamilton’s A-listed building and provide a long-term sustainable future for this architectural masterpiece which has had no continuous occupation for 47 years and is in a challenging state. Although private money is behind the restoration project, the building will remain in public ownership on a long-term lease with the council. The development will also provide public access to the former boys’ school for the first time. Award-winning architect Gareth Hoskins OBE heads the project team. Gareth was responsible for the redevelopment of the Grade A listed National Museum of Scotland and is about to embark on a project to extend the National Galleries of Scotland. Andrew PK Wright OBE, one of Scotland’s foremost conservation architects, is a key advisor to the project and has prepared the Heritage Report for the application. 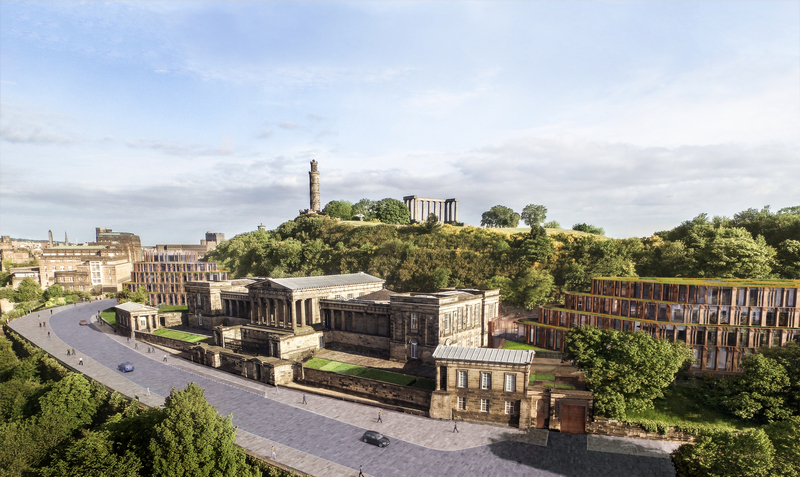 The proposals include substantial improvements to the public areas along Regent Road/Waterloo Place with the new hotel acting as a catalyst for improvements to Calton Hill through a new management plan. The city’s hotels will benefit from the raising of the Average Daily Rate (ADR), currently one of the lowest in Europe for a capital city. A world-class hotel in Edinburgh would attract tourists from the top end of the market as well as boost the numbers of visitors staying in the city’s hotels during the off-peak months. The new hotel would showcase the very best-in-class of Scottish food and drink, goods and services and design and artistic creativity. It would also offer unrivalled panoramas of the city. Duddingston House Properties was formed by Bruce Hare in 2000 following over 20 years as Principal of PJM Architects. Bruce has over 30 years’ experience in how best a vision for a project can be established and delivered. David Orr of Urbanist Hotels, a specialist hotel investment and development company, is one of the UK’s leading hotel developers and was the co-founder and CEO of City Inn Hotels, later renamed Mint Hotels. He was also instrumental in the introduction of Harvey Nichols to Edinburgh. The former Royal High School on Regent Road was designed by architect Thomas Hamilton, as a new school to the east of Calton Jail, and was completed in 1829. Hamilton’s building is one of the best examples of Greek revival architecture and the building was used as a school until 1968 when the Royal High relocated to Barnton and the Scottish Office bought the building with a view to it becoming a home for the Scottish Parliament. The City of Edinburgh Council reacquired the buildings from the Scottish Office in 1994 and despite various other suggestions for cultural uses, such as a photography or military museum, the A-listed building has lain empty for 46 years. In 2010 Duddingston House Properties won the City of Edinburgh Council competition for long-term lease on the buildings which it plans to restore as a world-class hotel. Oxford Economics is a world leader in global forecasting and quantitative analysis. Headquartered in Oxford with offices around the world, the company employ more than 150 people, including over 130 economist, industry, experts and business editors and benefit from a network of 500 contributing researchers.